Tony Bianco has been expressing himself as a full time artist since the age of twenty. His work displays a love for life, nature, and for communicating emotion visually. In 1990, Tony began to experiment with plein-air painting that is, working directly from the subject, on location. He embarked upon a study of working from life, in the landscape, throughout all seasons, striving for honesty and clarity in his style. 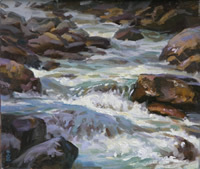 In 2000, he traveled with his family across Canada, painting a series of works depicting our National Parks. All the work was done on location, resulting in 75 paintings. This was also the year that he was chosen by the Royal Canadian Mint to design the millennium two-dollar coin, now in circulation. Since that time, he has designed a number of coins for the Mint, including the current 2006 two dollar coin, the Georgian Bay $20 silver proof coin, a $100 gold coin and a $50 silver coin. Tony continues to explore his world through painting, whether it be landscape, animals, birds or figures. 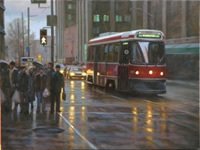 He now divides his time between working on location and in the studio where he develops more complex paintings. His studio/gallery is located in the scenic Mt. St. Louis area of central Ontario where he lives with his wife, young daughter and son.